Platelet Rich Plasma is concentrated blood plasma which contains approximately three to five times the number of platelets found in normal circulating blood. PRP therapy is a revolutionary method to overcome the problem of hair loss and wrinkles on the face. It has no Side effects. 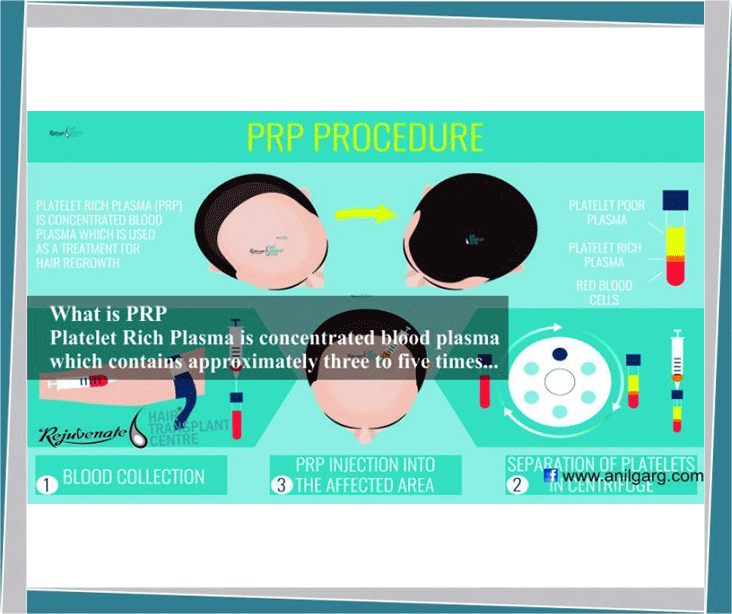 PRP therapy is adopted for glowing skin and long thick hair of both women and men. Due to a change in lifestyle and nutritional deficiencies in the body, it is essential to take care of your hair and skin. With increasing age, the lack of collagen in the skin increases the problem of wrinkles and defective lifestyle or other factors like stress increases hair fall problems. If you are bothered by this problem, follow this PRP therapy. Platelet Rich Plasma, contains various growth factors like platelet-derived growth factor (PDGF), vascular endothelial growth factor (VEGF), Transforming growth factor(TGF) and other bioactive proteins that aid in hair loss and wound healing. This therapy is effective for our hair problems as well as for skin rejuvenation. First of all withdrawal of 23cc of blood in syringe having ACD solution (Anti Coagulant). Then put blood in sterile test tube. Put the test tube in refrigerated centrifuge machine for 13 minutes at 3000 RPM. Plasma is separated and put again for second spin for 8 minutes at 5000 RPM. White platelet concentration at the bottom which is aspirated. Then this activated PRP is injected into the scalp with fine needle. PRP is done at the interval of 2 months and at least 4 to 6 Sittings are needed. If PRP is done for face (for wrinkles) It is also known as vampire facial. Benefits for hair loss: In the medical treatment of male and female pattern baldness (androgenetic alopecia). PRP can be injected into the balding scalp to potentially stimulating thin (miniaturized) hair to grow into thicker (terminal) hairs and it improves quality of hairs. Patients with thin, but not totally bald area, would be the best candidates.